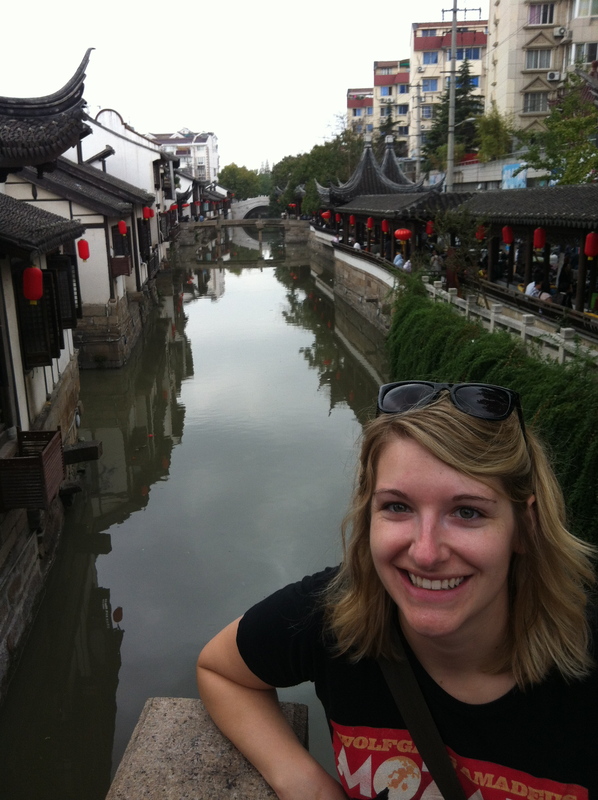 Angela and I spent the final Saturday of our October holiday exploring Nanxiang, which is an old river town in the outer reaches of Shanghai. The major draw was that Nanxiang is the supposed birthplace of great dumplings. Or maybe a special kind of dumpling. Either way, there were a ton of dumpling shops. Once we arrived at the Nanxiang metro stop on line 11, we went into a Starbucks to get some coffee and figure out where the old town was. Starbucks is a rare sight in China, so we take advantage of the special times that we find them. Sometimes we have to travel further than a block to find one, which is very disconcerting. You can read all about how extremely rare Starbucks is becoming here. Once we figured out how to get to Nanxiang, I was quickly impressed by the lack of really touristy shops. There was still some junky souvenir shops, but mostly Nanxiang seemed to be a legitimate little area, used more by the Chinese than by visitors. In fact, I only saw two other foreigners while we were there. This added a little bit of authenticity to the visit, which I really appreciated. The crowd was not overwhelming either, and the actual Nanxiang area was on a river, and quite beautiful. Nanxiang, to the best of my knowledge, is just a little ‘town’ within Shanghai. We did not even travel far enough out to consider it the suburbs. Angela sitting on one of the four main stone bridges connecting Nanxiang. 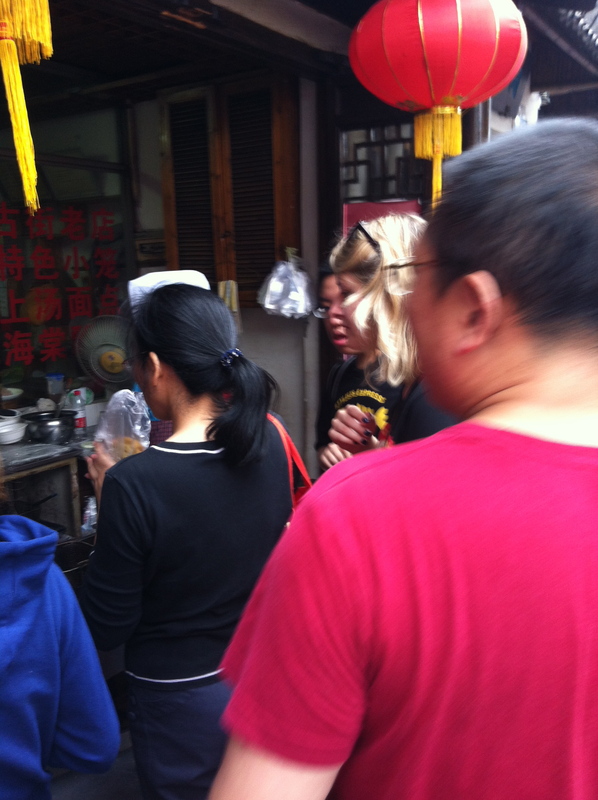 We quickly found some street food that Angela decided we needed to try. Her rule of thumb is: crowds and long lines=good food. She is quite aggressive when it comes to the Chinese way of pushing and shoving through crowds, so we did not wait long to try this one. I have no idea what it was called, but I liked it. 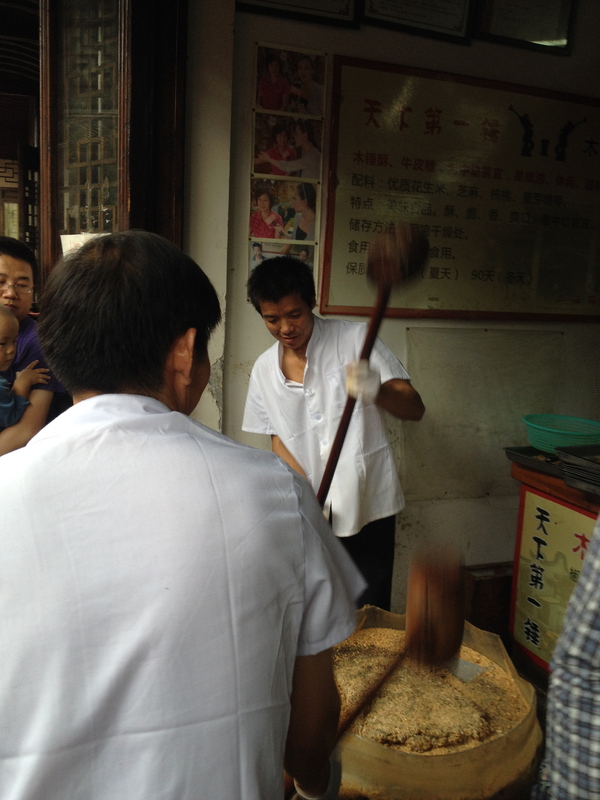 On our walk through Nanxiang, we saw these guys hammering what looked and smelled like peanuts into a paste. Homemade peanut butter? What you didn’t see is that immediately after we took this picture, these guys put it into a Jiffy container and shipped it to Iowa. 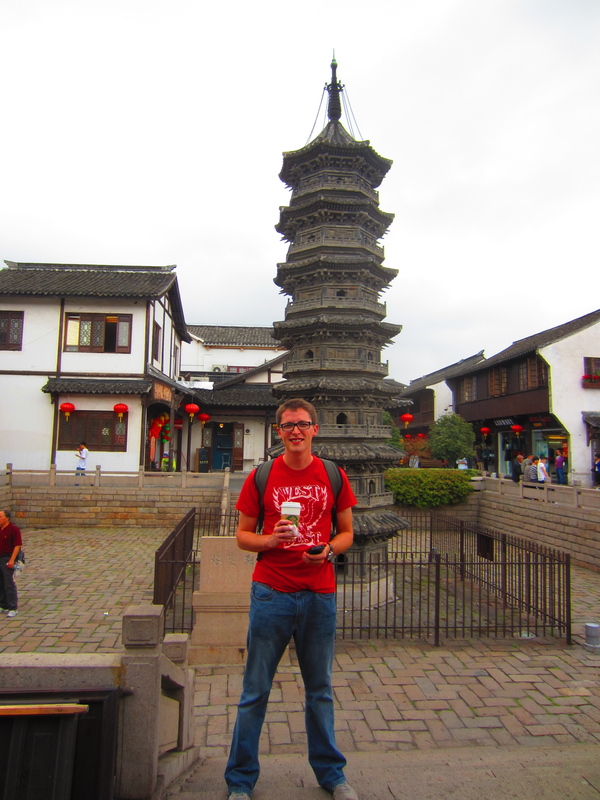 Behind me is one of the two towers in Nanxiang. They are very old. If you were curious, this is the area that Frodo had to bring the One Ring to destroy it. We didn’t see any lava, though. 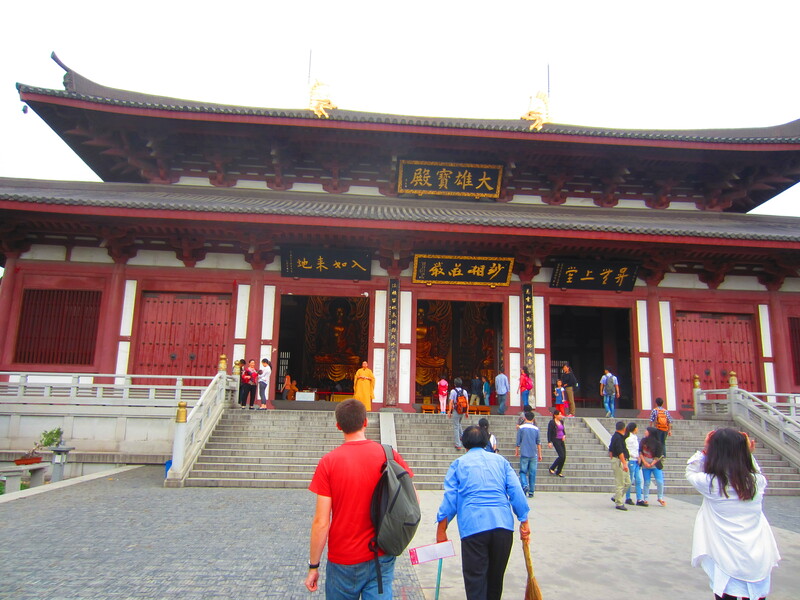 Of course Nanxiang had a buddhist temple, so I had to go. It was very active, with a lot of monks and a pretty major session going on in the main hall. There was a lot of nonstop chanting, and monks and nuns alike were studying books while kneeling in front of the massive statues. 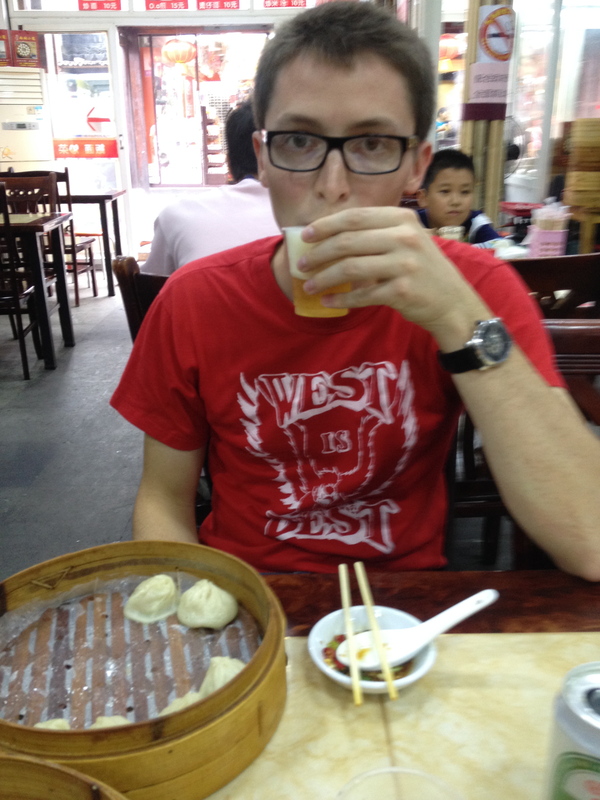 We decided to try some of these famous dumplings that we kept reading about. The restaurants were a little difficult, because nothing was in English and there were no pictures. Nanxiang appears to be a place for the locals, which I really appreciated. The owner was from Taiwan, and had some English. He helped us order some delicious dumplings. Angela decided, contrary to my voice of reason, that we needed to order two different types of dumplings. They each came in a group of 15, totaling 30 dumplings. We finished all but one, and though it was the only real meal I ate, I am still feeling ill almost 24 hours later. I still believe, however, that it was worth it. All for now. Do they have good beer? What are your favorites. What is the conversion rate of the local money you are using. And what are in the dumplings. I know, a bit scattered questioning. Keep blogging. Its very interesting.